To be fair, we should note that Springdale was the very last stop of the night and while we were very careful to avoid gorging on pizzas throughout the day, it was unavoidable to an extent and the scores may have reflected that. 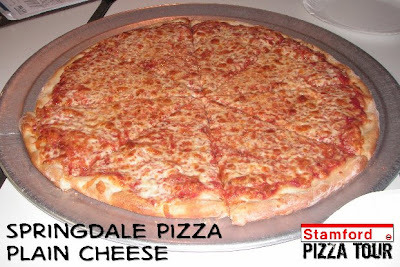 In any event, Springdale's entry was a piping hot, classic cheese pizza with a thick, chewy crust, hearty, well seasoned tomato sauce and good quality, stringy cheese. Kait: "Sauce is tasty, cheese is good, pie is very hot, but the crust is not the best." Elliot: "Crust is very thick, sauce is a bit plain, regular." Allison: "Crust is too much. Meh." Scott: "Crust tastes excellent but is too thick and too chewy." Dan: "Good, but not magical. A little underwhelming to be honest." 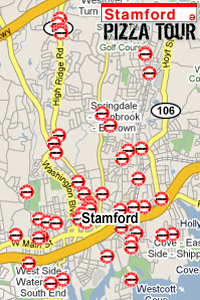 We can't take anything away from Springdale. While their pizza finished last in our Tournament, they have nothing to be ashamed of as their 45+ years of experience yield pizzas that are consistently among the very best in town, backed by a welcoming, family dining experience.